I rarely showcase nail art on the blog (or on my fingers) because I never find any designs that are minimal enough for my taste, or polished enough to wear in my everyday life. That is until I came across Paintbox nails. I first began seeing their manis all over my Instagram feed and thought immediately "these designs are so chic and understated" followed by "I need to try this place asap!" So when they reached out to me recently to come down and try out their services, I was ecstatic. Founded by a former beauty editor, Paintbox is tucked away on a quaint side street downtown NYC - you could almost miss it if you were not looking for it. Once you walk inside, it's quiet and comfortable with inviting decor that evokes a feeling of a "trendy nail salon" but thankfully without the attitude. And since they only do manicures, the space is adequate to hold a good number of clients without feeling that we are sitting on top of one another. Here is a picture of the nail area and drying station - I told you, super chic yet warm and inviting. While you can get a traditional manicure (or gel if you prefer), their specialty is nail art. And the best thing is they have a book of designs for you to choose from. And as someone that cannot make a decision for the life of me, I was thrilled that there were not an overwhelming number of choices that make you waste your entire visit just deciding on a design. Their designs also change each season which I love because you always know it will reflect the current trend or colors suitable for that time of year. Below is the book of options - and my chosen look for my nails. As a social media lover, the most brilliant thing about this salon is the mani-cam built into the wall that you can use after your manicure. Just put in your email address and place your hands under the camera and your decorated digits are Instagram ready. See my pic below. For timing purposes, make sure you give yourself a good 45min - 1hr if you choose to get nail art because these things do take time. But trust me, it's worth it. My birthday is in two weeks and I am already going back to treat myself to a birthday manicure. Now my only task is deciding on my next design. 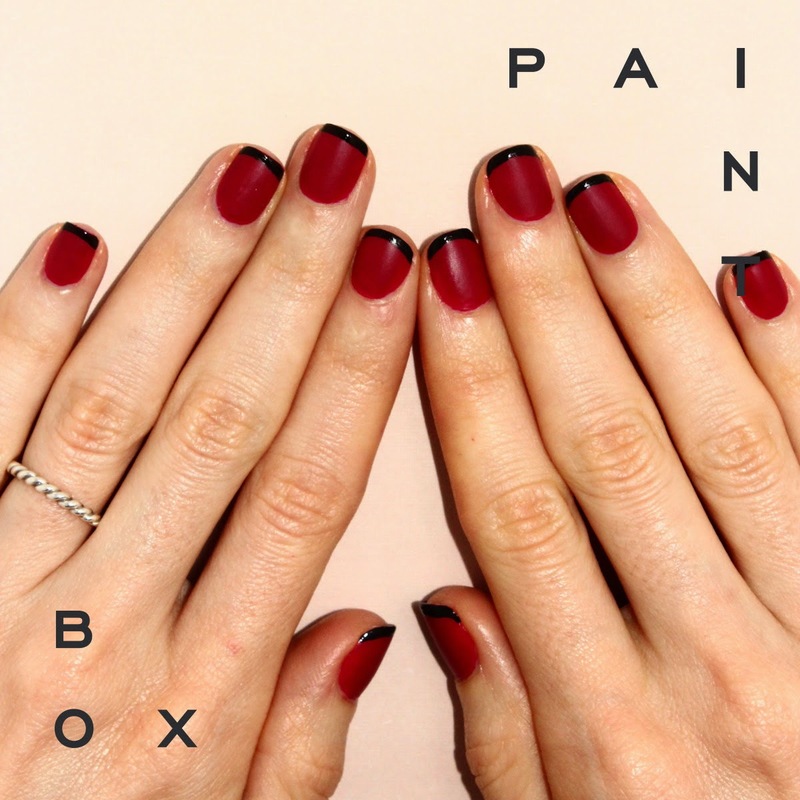 To book an appointment or more details, visit the Paintbox website and blog. And if you go, make sure to tweet me (@alittlebitetc) a picture of your nails! This is really a cute look, Maree! I definitely like the look of a French tip sassed up with a color other than white. Now on these, was it: Maroon, then matte coat, then glossy black tip? And that black tip is so perfect, did they use a guide or tape? That's impressive! I showed a girlfriend a picture of a similar mani (grey/hot pink) back in the spring and told her we should get a pedi like that, but we couldn't figure out how they did the tip color. When you're an artist, you're an artist, no?